Many commercial and home gas stoves have cast iron burner caps and grates. Iron used in cooking needs to stay seasoned. If left unclean for too long, the caps can become caked with an unsightly buildup of grease. 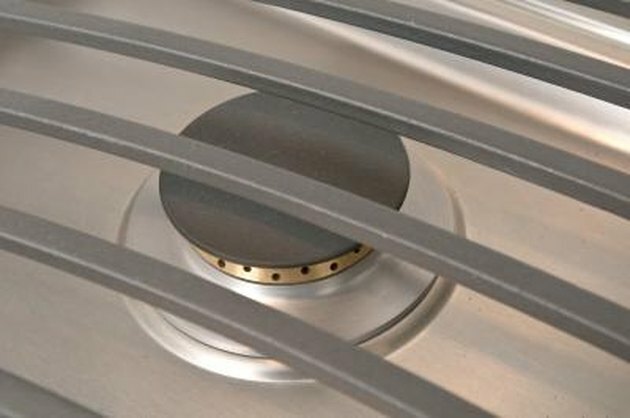 An over-accumulation of grease can smoke when the burner is on, becoming a potential fire starter. The caps, like the grates, are typically removable, making for easy cleaning. After cleaning caps, season them lightly to ensure a glossy appearance and enough lubrication to prevent rust. Keep iron caps in good condition with regular cleaning and oiling. Remove the iron caps from the centers of the burners. Set the caps on a surface lined with newspaper. Knock off any crumbly, stuck-on bits from the caps, using a wire brush. Spray the caps with biodegradable oven cleaner until completely coated. Leave the oven cleaner to soak for a few minutes. Wipe the caps off with a sponge dampened in hot water. Soak the caps in a solution of hot water and dish soap and scrub them under water with a scrub pad to remove any remaining gunk. Pour a dollop of vegetable oil on a paper towel and rub the oil onto the caps. Apply vegetable oil liberally, massaging it into the iron. Wipe off all excess vegetable oil with a dry paper towel. Replace the caps. The caps may smoke for just a moment when first lighting a burner.